Nickelodeon's popular game show Double Dare made a big comeback this past summer with all new episodes for grown up children of the '90s and a whole new generation of kids to enjoy. 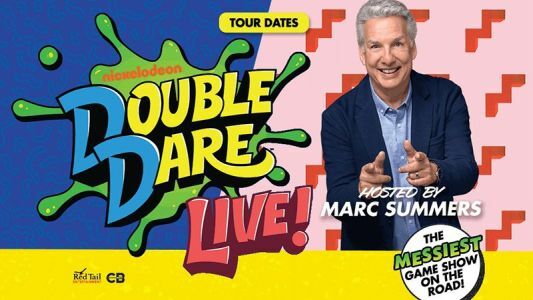 Now Double Dare will give fans a whole new way to experience the trivia and physical challenge competition series with a live tour heading across the United States this fall, and original host Marc Summers and his beloved sidekick Robin Russo will be coming along with it. Find out everything you need to know about the Double Dare Live tour below. Nickelodeon's Double Dare Kicks Off Multi-City U.S. Tour! Nickelodeon announced today that they are kicking off Nickelodeon's Doube Dare Live , a multi-city live stage tour inspired by the iconic TV game show Double Dare. Featuring original host Marc Summers and his beloved sidekick Robin Russo, the live stage show will debut in Fayetteville, NC, on October 30 and will tour North America through November.